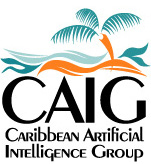 The Caribbean Artificial Intelligence Group was founded in 2004 when Armin Zundel and Kay Berkling moved from Switzerland to Puerto Rico. Since then we've helped to build up the Master Degree in Computer Science. We are now working on building up a research lab within the "Window to the Caribbean" project. This lab consists of several work-areas for students and a social corner with sofas in a multi-media smart room. Imagine this as a sort of holo-deck in which an embodied agent moves across four plasma screens and can see and interact with the people in the room. This part of the project serves as the base technology for our research. While we are not inventing any of the technologies, the goal of our work is to integrate state-of-the-art technology from speech, vision and gesture generation to highlight necessary improvements/changes for this integrated approaches. Our second goal is to personify this room by outfitting it with human-like artificial intelligence, that includes the ability to learn and understand and show emotions. Our research students are Seniors that enrolled in Capstone I & II as well as undergraduate research class. Soon the first Master students will reach their thesis stage. We take students from Computer Science and Electrical Engineering majors. We currently do not have a PhD program, but we are happy to host students from other Universities. 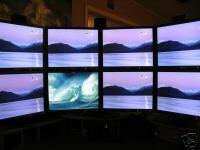 We have been awarded a DoD proposal to fit three rooms with multimedia equipment for remote collaboration. Who would be interested in connecting their multi-media enviornment with ours - see our flyer. Speech recognition brings a new, fascinating dimension to the life of PSI. With the new integration we investigate how and if PSI can recognize speech and hold a simple converstion about the environment. Can PSI speak Spanish and English? Can PSI translate? Can PSI recognize who is talking? These are all difficult areas to work on, especially in the noisy environment of our lab. We are looking for industry advisors for our students! We are happy to be able to use Dragon Natural Speaking for our research. PSI is used to live on an island and now we are bringing him to Puerto Rico. Undergraduate and graduate students are welcome to find out more. We are very much interested in any collaborative proposals with other Universities that would promote exchange of students or faculty. Likewise, we are very interested in integrating technologies from your lab. We can offer you Puerto Rican Spanish speech and real applications for regular language translation in the classroom. We have free housing for visiting scientists to our lab - though absolutely zero funding for any travel or visa arrangements. We are actively seeking for interaction with interested people in this field world wide. We would like to host visiting researchers who would like to work in this environment - we offer free housing and Caribbean beaches and mild winters. We want to integrate vision with PSI. If anyone is interested to form a collaboration based on vision and face recognition that we can incorporate with PSI, please let us know. New subsidiary in Germany - Literature Based Learning This site will help you with foreign language learning. Graded books for English, German, free phonics readers, science books sorted by age group showing links for Germany, US and UK. Stop by and take a look. We plan to generate free educational materials in combination with literature based language learning books that we sorted for you so stop back frequently. If you are interested in scholarship and internships we have opened a yahoo group to post this information.